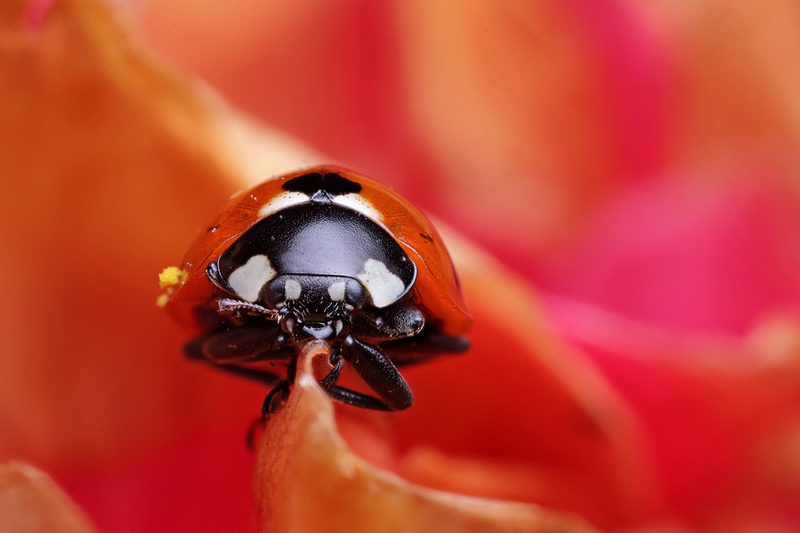 A 7- spot ladybird balanced on the edge of a camellia petal. 5Dmk2/MPE-65/430Ex flash. Focus stacked using zerene. This is exquisite! I love that you captured a bit of (what I think is) pollen on the side of the ladybird. Love this one and the color is wonderful. And I agree with Denise - pollen adds a great layer. Thanks for the comments Denise and Jo - yes it is a bit of pollen on it's side. I'm not usually a fan of the insect macros. I can certainly appreciate the skill required for the creation of the image, it's just not my favorite subject for viewing. However there is something really appealing about this lady. I like the soft curves of the background colors, and the face-on view of the ladybird is not the view typically seen (I usually see shots of the back showing off the spots). I'm glad I stopped to look.